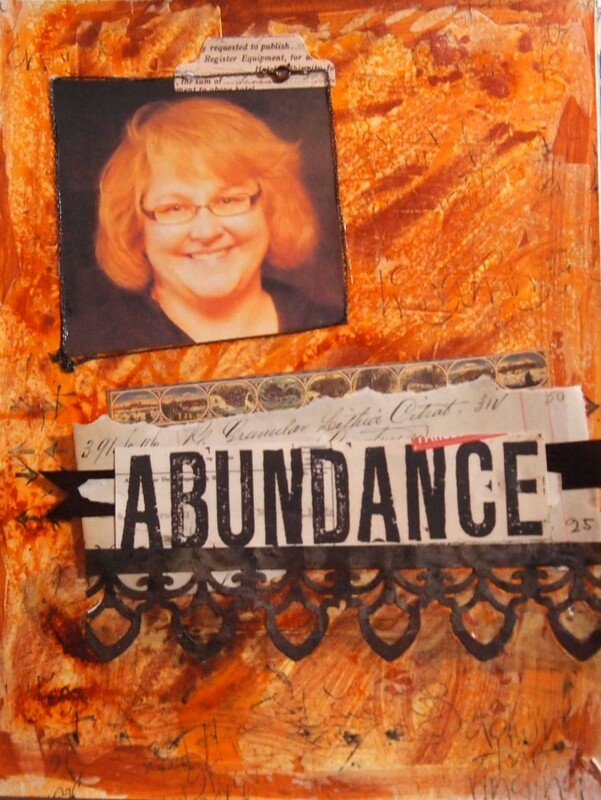 This was a tough crusade for me – to get me in my journal. To be in FRONT of the camera. I am a one woman “mammaratzi” & have been for years – so there aren’t many photos of me. even though I often had 2 cameras with me on a vacation or at an event. I worked on this challenge throughout the month – searching for photos and I found something unplanned. Why did it take me so long this month? I thought I’d be self conscious about seeing myself but no – it was getting lost in the memories of all the events I had photographed. I have photos of silly moments with friends at art retreats, photos of the wonderful kids I taught, photos of a loved one we lost this year, photos of places I’ve visited, fish I swam with, family moments (often very silly), and more. 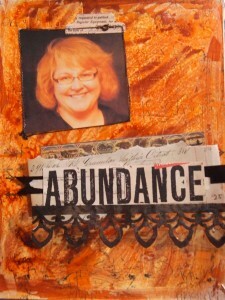 My page in my journal reflects what I was reminded of while searching for photos – abundance. I have an abundance of amazing people in my life. Started with this photo that had a bit of a golden tint due to low light. It went perfectly with a copper background I made some time ago. My new Martha Stewart punch had great arches in it. It also had cute flowers, but I just cut them out. The tab and big word were from scrapbook papers. The bones of my page felt in place, now it was time to fill in the details. Added a bit of stamping on it- just hints of it- you can barely see it here. The punched element was just lost – too hard to see. I tried darkening it up. Not enough. Darn, wished I hadn’t glued it down. Pulled the punched element up and added black spray ink and more brown. Now it is darker! Added an old chain around the photo. Stacked some papers and ribbon under abundance. A very Happy New Year to you, Carolyn! I like the word you chose for 2012. Wonderful abundance page. It sounds like you had a lovely trip down memory lane whilst checking through your images. 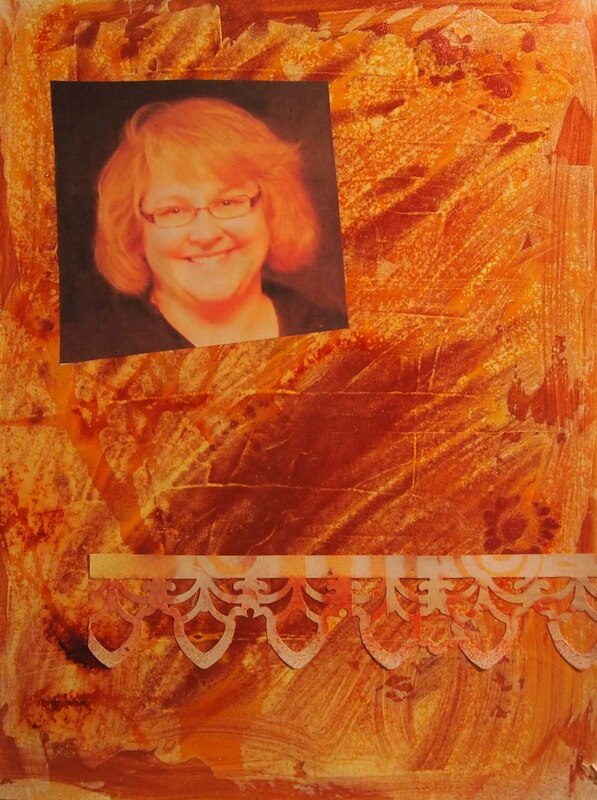 Carolyn – fabulous piece! I enjoyed walking through your process as you narrated and visually displayed the steps. (That takes alot of work, great job!) 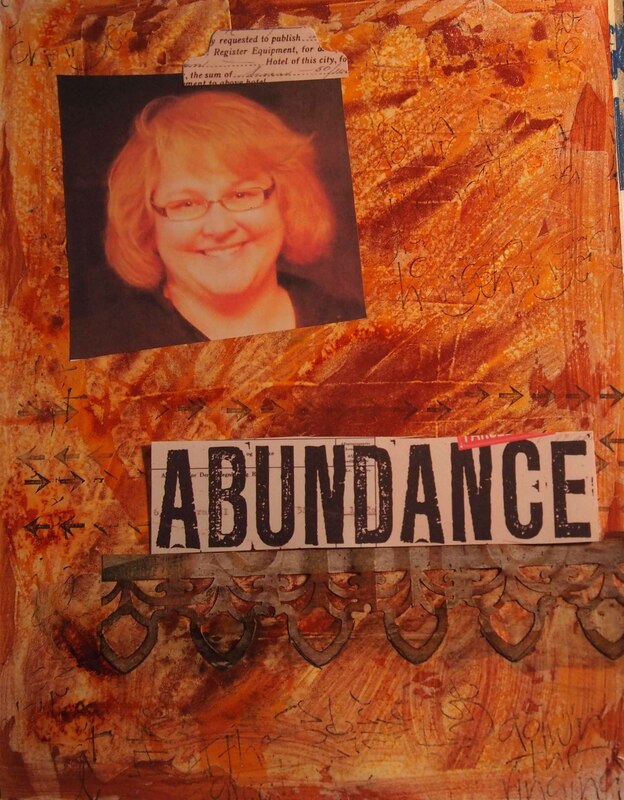 I love that while looking through the photos of 2011 you were sent in another direction….recognizing abundance. Lovely perspective. Fun to see your now-familiar face 🙂 Check out my edit on Crusade No. 58….you are standing next to me in photo #12. HCIT? Thanks for sharing with the team Carolyn. Happy 2012! Wonderful page! the colours are beautiful, as is your smile! A very happy new year to you and your loved ones, Carolyn, may it be filled with joy, abundance and colour! What a gorgeous page! I love the colors and the layers and the textures! Those arches are fabulous. And thanks for allowing yourself to grace the page with your beautiful smile!! Mammaratzi! LOL!!! Love it! Happy New Year, Carolyn!!! 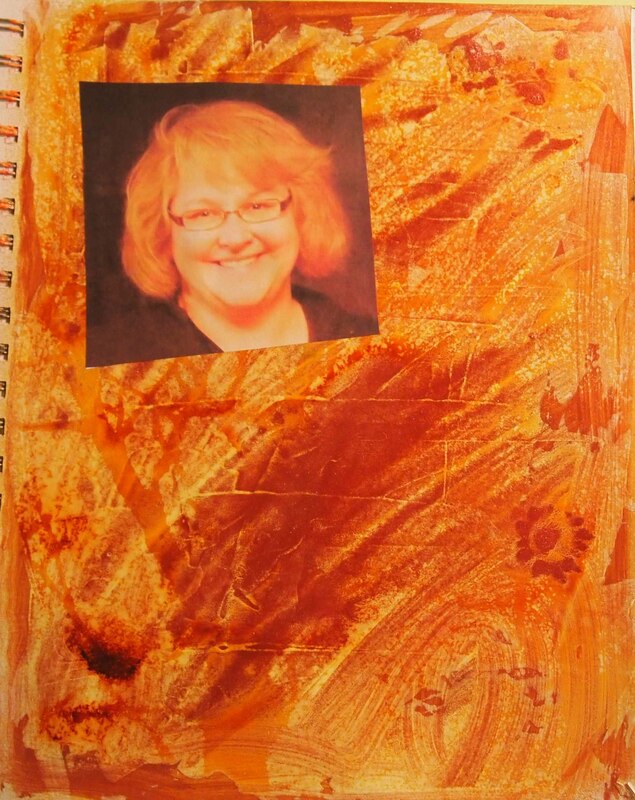 Such a terrific journal page & your photo is just great-what a happy smile you are wearing! Loved reading about your thoughts & the process as you created this wonderful page 🙂 Happy & blessed new year to you! Carolyn, thanks so much for visiting my blog & commenting. I really enjoyed reading your take on this challenge. Wonderful colours, texture and photo of you!! Love the journal page!! Wishing you a marvelous New Year! Happy New Year Carolyn to you and your family. I love this post it’s full of warmth and joy. It’s a pleasure to be an observer and companion on your creative journey. Wishing you a very happy New Year, Carolyn. Your journal page is great; Martha Stewart punches are a favourite of mine too. I, for one, LOVED seeing your shining face looking at me….made me miss you! Your page looks fabulous!!! Great Layout! 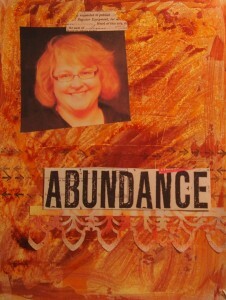 The “Abundance” text works really well! Love the term “mammaratzi”! Haven’t heard of it before but totally understand what you mean! Great page and oooh that MS punch – love it. But they are *so* dear to buy here. Anyway, glad you got out from behind the camera. Well done you! I don’t have many pictures of myself either for two reasons: I am not photogenic and most of the people I know don’t take very good pictures! I think this whole piece turned out wonderfully and I love seeing your beautiful, smiling face!